Scattered on technology specialist Amit Bagwe's desk beside his laptop are a Sam sung tablet and an iPhone7. The article by Shalini Umachandrani was published by Times of India on November 7, 2017. Nirmita Narasimhan was quoted. It's like any other tech worker's desk, except for the portable electronic magnifier he uses to read what's on his screen. Bagwe, who was born with low vision and lost sight in his right eye in 2005 following an accident in the chemistry lab, works with BarrierBreak in Mumbai, helping companies modify their software to include the needs of people with disabilities as well as train the disabled to use software. "Saying technology is a boon may seem like a cliche but just ask a person with a disability," he says. Forced to drop out of college after the accident, the turning point came in 2012 when he signed up for a threemonth internship at BarrierBreak. "That's when I started using screen readers," he says. He returned to college for a BSc in information technology. "I could study on my own, navigate the city, go to a restaurant for a meal. I never thought I'd own a smartphone let alone use one," he says. 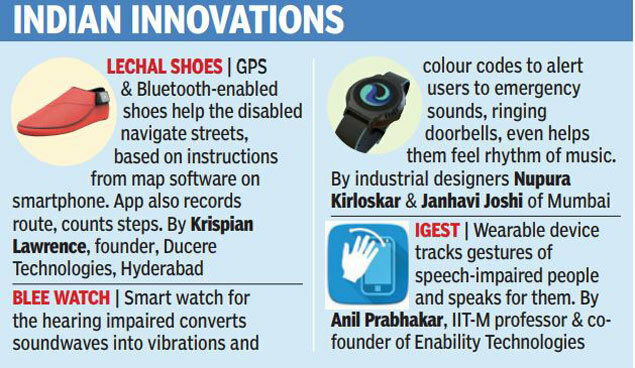 Assistive technology designed to help people with disabilities with their daily tasks is a huge and untapped market in India largely because developers and companies are unaware of their needs. There's been progress in recent years -for instance, buried in the settings of any smartphone are accessibility controls for the disabled -but not all products, apps and devices are easy to use since the needs of the disabled aren't considered at the design and conceptualisation stage. Dr Nirmita Narasimhan, senior fellow and programme director, Global Initiative for Inclusive ICT, is confident that technology will reduce inequality and inability, and negate frustration. But there are hurdles. "We have screen readers but the technology is not enabled to support a third-party device, or someone hires a consultant to make a website accessible once, then more content is uploaded later and that's not accessible," she says. Gaurav Mittal, co-founder of EyeD, an app that uses the smartphone's camera to guide people, says the main challenge is empathy. "Observing the world as a person who cannot see is hard. And they are slow to share deeply with us. What makes them laugh, what makes them cry, we need to know this to truly design a product that will help." With the app and its text reading function, a visually impaired user can navigate streets, find landmarks, and identify objects of interest. His team has also developed a customisable Eye-D keypad that makes smartphones easier to use for the blind. Mittal started Eye-D as "a hobby project" in 2012 after spending a day at National Association for the Blind in Bengaluru during a CSR event for his former employer. "I was amazed that visually impaired people could code and use computers easily but struggled to use a smartphone and do things such as navigate the city independently," he says. In 2015, he quit his job and went fulltime; the app is now used by people in 160 countries. EyeD launched a Hindi reading OCR (optical character recognition) version last month, costing Rs 800. Ajit Narayanan points out that software developed for the disabled community can serve a wider population. His Avaz app and its complementary FreeSpeech app -developed to help children with cerebral palsy, autism and speech impairment use pictures to communicate and learn grammar and language -is now also used by students in China to learn English. "Conversely, the iPad, invented for people without disabilities, had so many features that made it easy for the disabled to use," says Narayanan, 36. He started his company, Invention Labs, in 2007 but struggled initially to create a device. "Once the iPad was released in 2010, things took off as we could just focus on the software," he says. Apple's Siri and Amazon's Alexa are based on speech recognition software devel oped for the blind but are now used widely just to make life easier for everyone. Microsoft recently released a free iPhone app that uses Artificial Intelligence (AI) to tell the blind what is around them. If the phone is pointed at a park, the camera app, named Seeing AI, can describe what the scene looks like. Similarly, it can tell the amount of your restaurant bill. The problem is that most people with disabilities are introduced to technology only at college level. "They lose so much time," says Siddhant Chothe, co-founder, Tekvision, a Pune-based startup that helps companies comply with accessibility standards. Chothe, who has had low vision since birth, says he's getting more enquiries for training and compliance since the government passed the Rights of Persons with Disabilities Act, 2016, which makes it mandatory for government and private service providers to make all services inclusive and accessible.Legislation means more developers will learn to create inclusive products and clients will demand them. "Inclusivity doesn't have to be an expensive afterthought," he says. "It's really quite simple to design keeping our needs in mind." In India, however, only a few can afford this technology. "This is because we are still retrofitting. All the solutions are coming from the West.We need more indigenous development," says Shilpi Kapoor, founder and CEO, BarrierBreak, an accessibility consulting and assistive technology firm. She's also started Newz Hook, an inclusive news website.